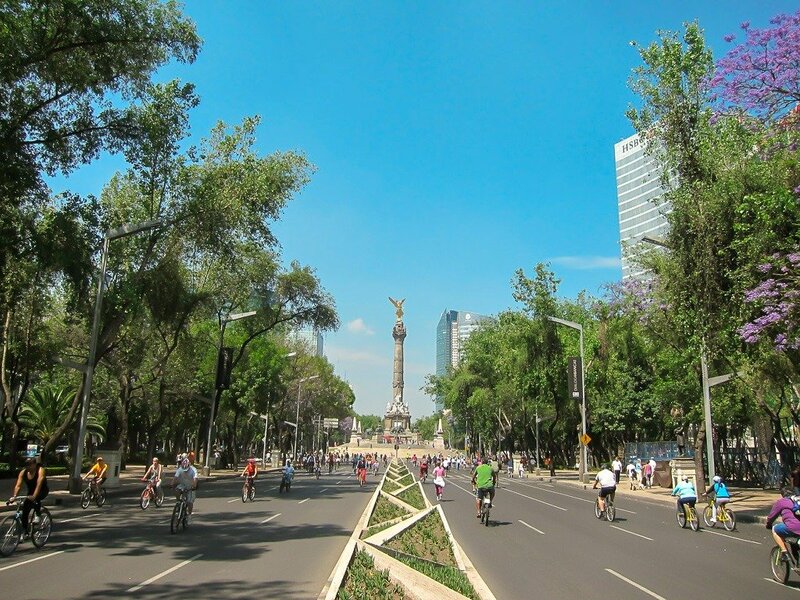 One of the biggest questions I get asked about visiting Mexico is how to get around the city. While I’ve written a pretty comprehensive post about all of the public transportation options in the city which you can read here, I want to talk more specifically about my favorite mode of transport. Uber in Mexico City is cheap, convenient, and safe. **If you’re new to Uber, you can get a discount off of your first two rides if you use the code: laurab18897ue when you signup! How Does Uber Work in Mexico City? If you aren’t familiar with Uber, it’s an app that allows you to call a taxi, choose your pickup and drop off destination through your phone, and prepay for it using a credit or debit card (in Mexico you can also use cash, but I’ll discuss that later). 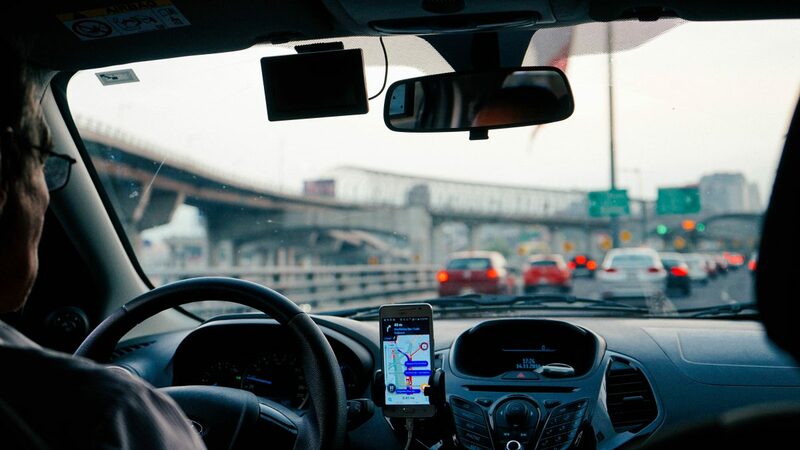 Once you are connected to a nearby driver, the app will give you the driver’s name, the type of car they’re driving, the color of the car, and the car’s plate number so that you know which one to get into. It’s incredibly simple to use. Once you get into the vehicle, the driver will then navigate to the destination you’ve chosen. This is amazing because usually, with regular city taxis in Mexico City, they often don’t have meters on or navigation systems to get you where you need to be. This might be fine for locals who know exactly how to get where they’re going, but for tourists who don’t know the city, you need to rely on the taxi driver to know the roads. Uber drivers in Mexico City will always either Google Maps or Waze (if they ask which you prefer, always choose Waze). 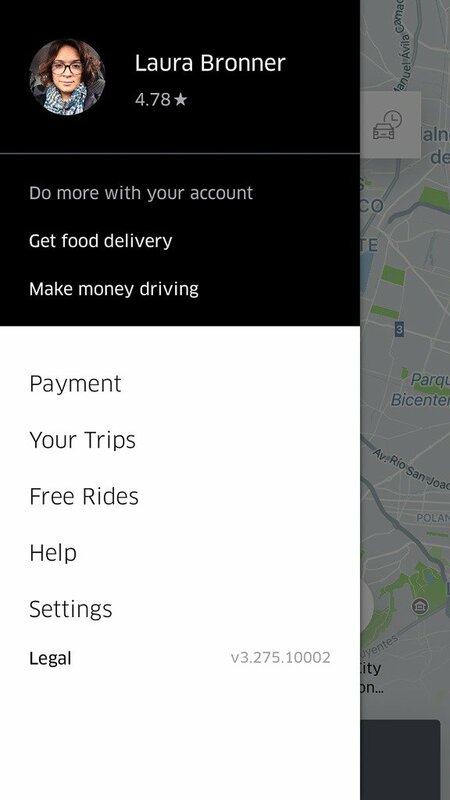 In some cities, Uber now allows you to add a tip, but not in Mexico City. You do not need to tip and in fact, my dad tried to give Uber drivers a tip when he was here and many would not accept it. How Much Does it Cost to Take an Uber in Mexico City? Uber in Mexico City is SUPER cheap when compared to Uber in New York or Ubers that I’ve taken in the UK. If you are going from Condesa to Roma, it will probably cost about 40 pesos or just over $2. If you are going from Polanco or Condesa to the Centro Historico, it might cost up to 65 or 70 pesos, which is about $4. The most expensive Ubers you will likely take are those from the airport. If you take an Uber from the airport to the city center, depending on what time of day it is, it can cost anywhere between 130 pesos and 200 pesos. That means the most you’ll spend is just over $10. Like in most other cities, the price of the uber can vary depending on how many drivers are in the area, how many people are calling Ubers at that given time, and how bad the traffic is. Sometimes you will be quoted a price of maybe 60 pesos, but because of traffic, it could cost 70 or 80 pesos. Like I mentioned above, if you’re new to Uber, you can get a discount off of your first two rides if you use the code: laurab18897ue when you signup. Full disclosure, if you use this code, I also receive a few dollars off of my next Uber ride. Is it Safe to Use Uber in Mexico City? While Uber may not have the best reputation in other parts of the world, Uber in Mexico City is one of the safest ways to get around the city. I regularly take Ubers by myself or with friends and I am always greeted respectfully and kindly. Drivers are polite and often overly helpful. Not many speak English, but the great thing about Uber in Mexico City is that you don’t really need to speak that much to get where you’re going. 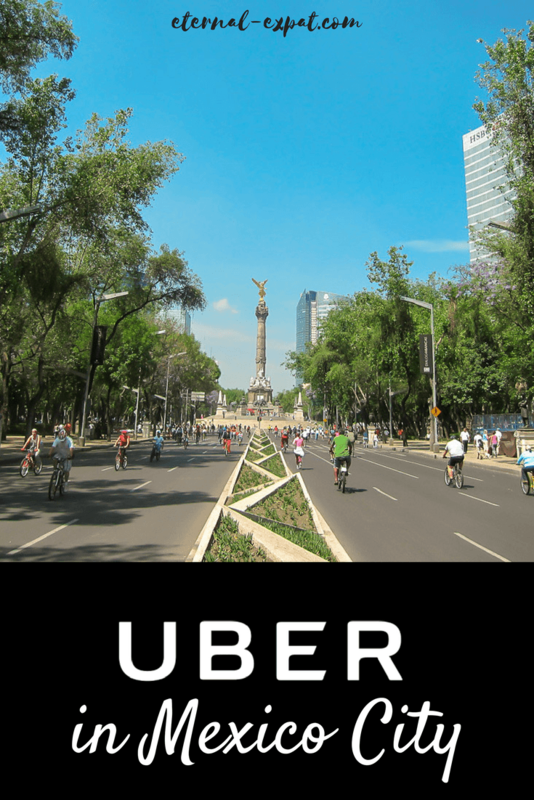 Getting an Uber from Mexico City airport into the city center is incredibly easy. Open the app and it will locate you. When you choose your destination and select Confirm Uber, it will ask you which door or puerta you are at. Look at the number of the door that you are at – it is likely two or three depending on which exit you came out of. You may have to walk to one of the doors because Uber cannot pick you up at every exit. The driver will then know to meet you outside that door. If you know the name of your hotel, but not the address, you can simply enter the hotel name into the search bar on Uber and it will find the address for you. If you would rather pay for your Uber with cash, you will have to go to the payment option under your phone as shown in the image below. You can then add cash to your preferred payment method. If you have a credit card already listed as an option, you may need to remove that from your phone as the app will automatically assume that is your preferred payment option. Be sure to have plenty of change as many drivers will not be able to break large notes like 500 pesos. Note: There have been mixed stories recently (April 2018) of people saying that they have not been able to pay with cash in Mexico City. It depends on the driver and the starting location of your journey as to whether or not you can use cash. Just something to be aware of. 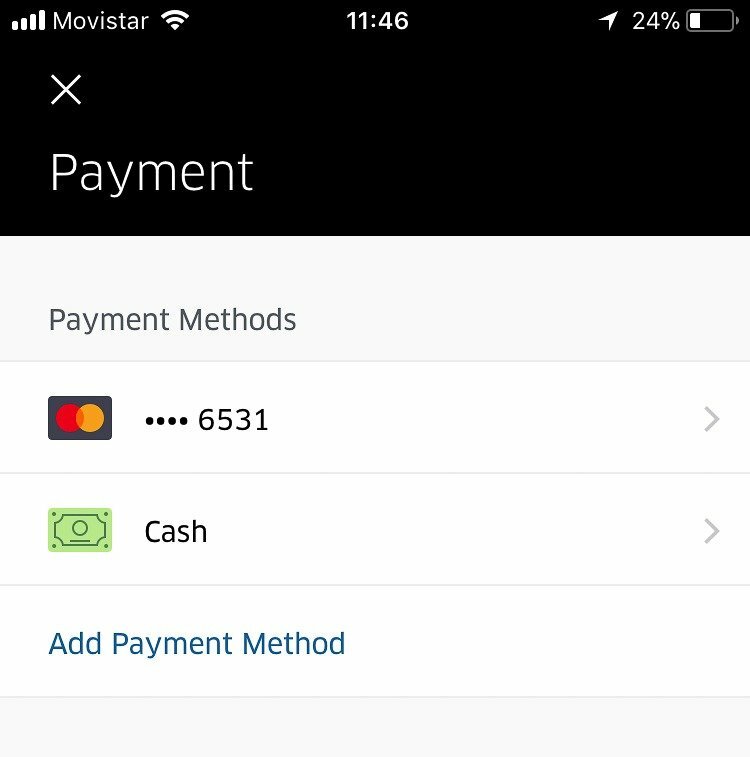 You can also pay with Paypal on Uber in Mexico City. You can set it up the same way that you would add other payment options. Simply go to “Payment”, then “Add Payment Method” and select Paypal. You will then go through the process of logging into your PayPal account and agreeing to the terms and conditions. 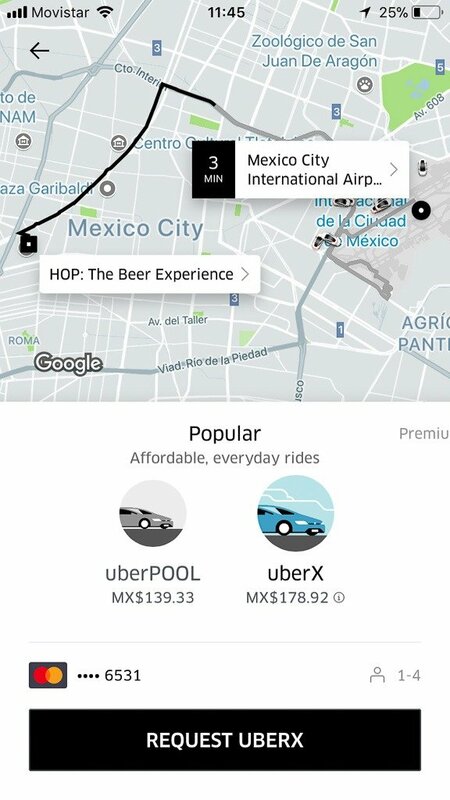 Mexico City has a few options when it comes to uber rides. When you open up the app and select a destination you will get two prices. One will be the price for UberPOOL and one will be the price for UberX. UberPOOL is pretty much what it sounds like, it is a carpool. You can only choose UberPOOL if you are traveling with one or two people. If you are three or more, you need to get UberX or the larger UberXL. If you are traveling by yourself or with one other person and want to spend a little bit less money, you can choose UberPOOL. The system will then attempt to match you up with other people who are headed in your direction. Sometimes no one is traveling in your direction, so you get a cheaper price without having to share. This hardly ever happens, though. Do I Use Uber in Mexico City? I use Uber in Mexico City at least twice a week. I live on the outer edges of the city, so if I’m going to be traveling a long distance, especially during busy traffic times, I’ll usually hop on the metro because it’s very cheap and much faster than trying to get around the city above ground. Transportation in Mexico City: The Cheapest, the Fastest, the Safest. However, I always take Ubers at night. If I’m going from a bar to a restaurant that’s located in another suburb, I’ll order a cheap $2 Uber across the city. If I’m going from dinner to my apartment, which can be up to 30 minutes away, I’ll get an Uber and it never costs me more than $6. As of January 2019, you can now add a tip to your Uber trip. Once the trip is completed you can now leave 10, 20, or 30 Pesos for the driver. I usually add a 10 peso tip unless they were really fantastic then I’ll give 20 or 30 Pesos. Leaving a tip is not required nor is it expected at this stage. If you’ve never used Uber before, sign up with this link to receive 50 pesos off of your first two rides. 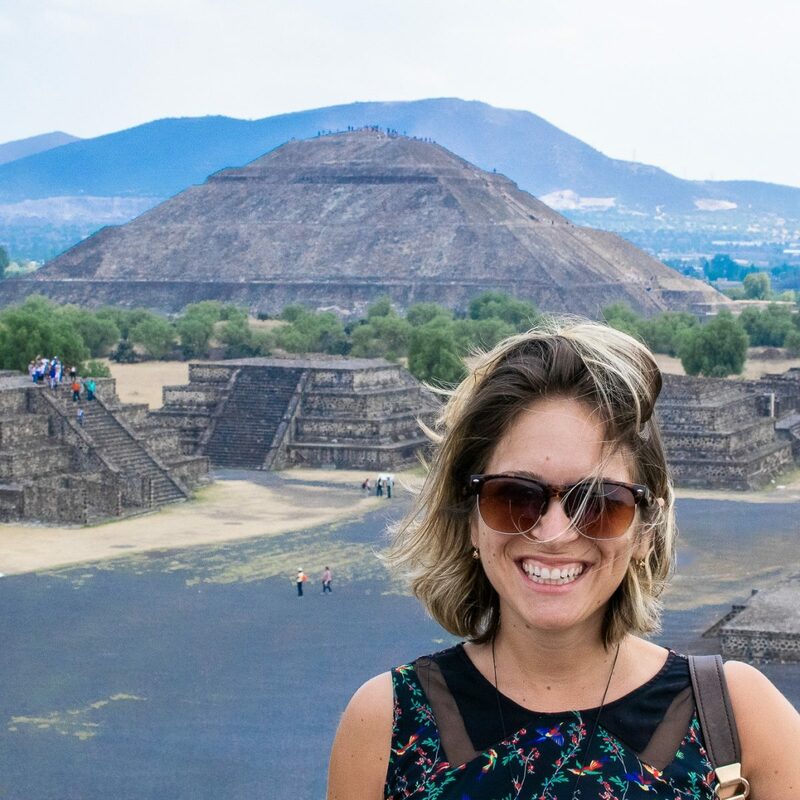 GET MY MEXICO CITY GUIDEBOOK! If you found this quick post helpful, you may be interested in Mexico City: A Travel Guide. It’s a digital guidebook that you can download straight to your phone and access while you’re on the go in Mexico City. Learn more about what’s inside the guidebook and how you can purchase it here. This helped out alot! Thank you for the great advice and information! So glad you found it helpful, Jose! Enjoy your trip! Do you know if Uber makes long distance trips? Say Mexico City airport to Toluca. I’m arriving late in the evening and would like to skip the bus if possible. That’s not too long distance – I know someone who took an Uber from Toluca to Mexico City, so I imagine that will be fine! Thanks for this, km actually headed to Riviera Maya, or Cancun I should say. And I was wondering how this would work. I do have some questions though, do I have to download a different Uber app in mexico and does my saved credit card/debit card work the same on their app or do I need to get a local card because I’m confused if the app does the rate exchange or do you see the totals in pesos? Hi Luis – Cancun does not have Uber. They did about two years ago, but they were pushed out by the taxis, so you won’t be able to use the app in Cancun. If you are going to places like Mexico City, then the app will work exactly the way that it does at home. You don’t need to download it again when you arrive and you don’t need to change your credit card. The app will quote you in Pesos, but it will charge you in your home currency. Hope that helps! Got it, thank you! I’ll definitely use it in Monterrey for the days I’ll be staying there. Hi Laura, we’re looking for a good trusted guide to spend the day at the Pyramids and Guadalupe! Any recommendations would be welcomed in English of french for ZE tour guide. I’ve had some great luck with guides whenever I use Olympus Tours and Get Your Guide. You can book directly through their websites! Really helpful and well written! Uber should definitely compensate you for this. Wish I saw it before signing up. The only reason I signed up for Uber was to get reliable transportation to and from my hotel and dental clinic in Mexico. Memories of getting gouged by cab drivers in Paris and other foreign cities, motivated me to sign up. Muchisima gracias! Thanks, Derek! I’m so glad you found it helpful! Hi Sue – it depends on your carrier. Many American phone companies don’t see Mexico or Canada as “roaming” although you’ll still have to switch it on, you won’t be charged. I’d ring your carrier before heading to Mexico. There is also wifi access at the airport, but it is limited to 5 minutes for free. im flying into mex city airport, and was thinking of taking uber to Puebla where i will be staying. when i tried it out on the app, it quoted a price of 1,330 pesos, about $67. is that possible? thats incredibly cheap for a 2 hour drive. not sure why anyone would take a bus and deal with all that, when Uber would get me directly to my hotel in comfort. yes more expensive, but compared to a 2 hour taxi drive in USA, seems well with it. It’s possible that that is the price, but it’s also possible that when the Uber driver sees where the trip is that they will tell you that they can’t take you (it’s over two hours away from the airport, so they may not be able to get a fare back). That’s also just a quote. You’ll also have to take toll roads, which will be added to the price of your Uber after the fact. Also, if there is any traffic or delay in time, you will likely be charged more – so it could end up costing well over $100. The price of a bus ticket is less than 300 Pesos at full price (even cheaper if you book a few days in advance on the ADO app), so less than $15, so it’s significantly cheaper. You can give it a try and if Uber doesn’t deliver for you, you can always take the bus. Alternatively, you could hire a car from the airport and head to Puebla on your own. I would like to use Uber in DF but for the short while I’ll be there I don’t want to get a SIM card. My hotel has wi-fi and I assume various places throughout DF will too. Question: Can I beckon an Uber from wi-fi spot then once in car turn phone to airplane mode so I won’t be charged roaming data charges? I read on your site that for the two years there you never got a SIM card yet you Uber around. Can you please clarify? Incidentally I love your site and videos. Gracias! Hi Laura! I’m heading to Mexico City with two of my girlfriends this weekend. They arrive a day before me, so I’ll have to get transportation from the airport to our AirBnb by myself. Would you recommend using Uber or taxi? And would you feel safe using it alone? I always use Uber – it’s much cheaper than airport taxis and incredibly safe in my experience. If you have any trouble getting one, you can always get an airport taxi, just prepay at one of the taxi stands. Both airport taxis and Uber are perfectly safe to use alone. Hope that helps! Enjoy your trip! Hi Lulu – yes you can simply order the Uber from wifi and then once you get in the car you can turn your phone back on airplane mode, it won’t affect the journey at all. Enjoy your time in Mexico City! Excellent post!!??????. My flight to mexico city is in a few hrs and now that i know uber is so great there i’m instanlY at ease! Happy to help! Enjoy your trip to the city! I will be traveling to Mex city over MLK holiday weekend and considering taking Uber but my concern is with the gas crisis they are having will there be ubers available? No need to worry about the gas crisis – I haven’t had any problems getting them since this whole thing started and news around here is that it is pretty much over with now anyway. It’s business as usual for Uber drivers! Under the section UberX vs UberPOOL in your article, the screenshot shows the pricing of your trip being over $150.00. Is it really that much? Or is that supposed to be a Peso’s conversion? The Mexican Peso also uses the $ sign. That is 150 Pesos, not 150 Dollars. Hi Danish – as long as you have a valid work visa, a Mexican license, and a car registered in your name in Mexico, I don’t see why not? The best thing to do would be to contact Uber directly – I believe there is an office here in Mexico City where you can register as a driver. Good luck! Does my USA Uber App work in Mexico City or do I need another App? Hi Bill! You can continue to use the same Uber app that you use in the USA. It will show you prices in Pesos once you turn on WiFi or your data here in Mexico. Enjoy your trip! Do you happen to know if you can request an Uber XL with a car seat in CDMX? Thanks! You can request an Uber XL, but not with a car seat. You have to provide your own with Uber here in Mexico. Thank you so much for the advices ! I will arrive in Mexico City this friday and am travelling alone. It is very good to know that it is safe to take Uber or authorized taxis from the airport and in the city. Hi Magdalena! Glad you found the post helpful. You can log into the Mexico City airport wifi, but only do it when you are ready to order your Uber because the wifi is only free for 5-10 minutes (I can’t remember exactly which, but it’s only very briefly). I use Uber all the time in Mexico City and for some time now you can tip the driver using the Uber App. Yes, I only recently noticed this and have updated the article to reflect this 🙂 Thanks Roy! Thanks for adding in the information about tipping – it will be so helpful to add a tip in the app! Because we pay in cash so often in Mexico we find it challenging to hold on to enough small coins and bills. Once in Vallarta we tipped $200 MXN on a ride that cost slightly less than that, because it’s all we had at the time!